Kimberly has shared her Gain Dryer Sheets review, along with her love of the Apple Mango Tango scent of Gain products. I first bought Gain's Apple Mango Tango (AMT) Dryer Sheets and I absolutely loved the way my laundry smelled. It was the only dryer sheets I have ever used that keeps my clothes and home smelling exactly as it does from inside the box. Most dryer sheets smell a little different on the laundry then it does in the box, and isn't anywhere where near as strong and beautiful of a smell as Gain's AMT. I am getting the detergent and softener tomorrow as I have been dying to have the set to make my clothes smell even more like AMT. And now that I see there are other products with this scent, like the febreze & dish detergent, I will be purchasing those soon too. I'm just worried about Lisa's review saying the scent has changed and hope my laundry smells the way I hope for it to smell. I will keep you posted. Thank You Gain for a GREAT scent! Thanks Kim for your review of Gain dryer sheets in the Apple Mango Tango scent. As I've said with other reviews of this scent (see many links above to other reviews of the detergent in this scent), those that love it REALLY seem to love it. 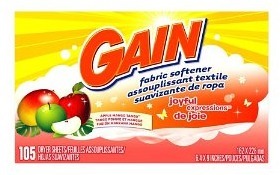 Does anyone else use Gain fabric softener, either in the liquid or dryer sheets? If so, you can share your Gain fabric softener review here.